To wear or not to wear them? There are some tennis players who like to wear sunglasses as a fashion statement with different coloured frames and/or lenses to match their outfit of the day. On the pro tour there a few players for example Samantha Stosur and Viktor Troicki who regularly wear sunglasses during their matches. At club level there are some Adult players wearing sunglasses during matches but very few junior players have adopted sunglasses as a part of their tennis kit. The practice of wearing sunglasses during matches is not often promoted by parents, coaches and club administrators so many players may not be aware of the pros and cons of wearing sunglasses for tennis. In addition many doctors and eye surgeons recommend using sunglasses to protect the eye from retina damage by the sun and injuries from getting hit in the eye by the ball. Sunglasses can also be the extra accessory to add to or accentuate the rest of your tennis outfit. To overcome this problem you should add secure elastic type straps to keep your sunglasses on and in position. Keep some anti fog spray, wipes or tissues in your courtside bag to help overcome the problem. 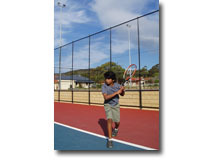 Sunglasses are at a disadvantage when the sunlight is fading or the court is covered with a mixture of shade and sunlight. However your normal eyesight without sunglasses will also be affected under these conditions. In addition to the information above talk to your coach(es), parents and even other players who wear sunglasses for tennis. After considering the pros and cons you must decide if wearing sunglasses during Tennis matches works for you. If yes then you are ready to take the next step. You may find a good medium price pair of Sunglasses but the old adage that you get what you pay for usually applies. When you have purchased your sunglasses then it is time to get used to wearing them during a social hit, coaching lessons and training sessions before you wear them during matches. I hope that the tips re wearing sunglasses for tennis outlined above will help you to decide whether sunglasses will work for you. Sunglasses can help you overcome the sun and glare factors during your daylight matches in particular and become a part of your regular tennis kit to help you win more matches and as a result take your game to the next level. Try not to confuse yourself by thinking too much. Let me know if you can think of any other options to help you achieve a more consistent and effective physical and mental game. Contact me by Email if you have any comments or helpful Tennis hints. Let me know the things that work for you.